Dario Ciriello is a graduate of the Clarion West class of 2002. He is the publisher of Panverse Publishing. Hi Dario! Thanks for agreeing to do the interview. First off, let's talk about Panverse Publishing. What made you decide to start your own imprint? I'd been thinking about my writers' group, Written in Blood, and how one by one we're getting agented and into print; the group, eight of us, includes people like Aliette de Bodard and Janice Hardy--a really fine group. So I tossed out the idea of putting together an anthology of our own work, and the group responded positively. But when I started looking into what was needed--buying ISBNs, contracting with a POD company, setting up as an independent publisher rather going the vanity route, and all the rest--I thought, "why stop there?" The rest, as they say, is history. Why the name Panverse Publishing? It's from a novelette of mine, 'Free Verse', that's currently doing the rounds. It's a pretty complex piece about alternate realities and parallel worlds. 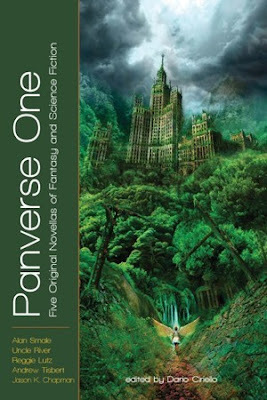 I decided to name the larger setting the Panverse, which struck me as far more elegant and poetic than the common terms, 'multiverse' or 'megaverse'. Do you have a mission and vision for the company? Or what makes it unique from the other independent presses? I imagine every independent press thinks it's unique (laughs). In terms of mission, I'm interested in story most of all. I think the SF and Fantasy field's very fragmented right now, and while there's some great work out there I don't see a single, consistent venue for the kind of stories that interest me. It's rare for even half of the stories in any magazine or anthology to grab me well enough to make me finish them. So when I wrote, 'Story. Wonder. They're back.' on the masthead of the Panverse Publishing website, I meant it. That's what I want to promote. Stories that are accessible, that grab the reader, that resonate. There are too many stories being published that are either dull, or hard work, or both. Can I ask what's your business plan? For example, are revenues solely based on book sales? Is the plan to simply cover expenses or branch out into something bigger in the future? Excellent question, and one that anybody crazy enough to try to get into publishing should ask themselves. Right now, revenues are based solely on book sales, and I'll be happy just to make my money back on Panverse One. The following volume needs to at least break even, and after that we need to show a profit. So after Panverse Two has been out a few months will be the time to take stock. If the next volumes do well, then I might see if I can get some backing to expand the operation. And every month that goes by brings us closer to seeing will survive the hurricanes bearing down on the publishing industry. Right now it's still damned hard to sell books without traditional distribution in bricks-and-mortar stores, which involves the return or destruction--at the publisher's cost--of unsold books. It's a ludicrous business model, and one that needs to go away. In a year or two, the game may be a quite different one. What made you decide to release Panverse One as your first title? What is it about the novella format that appeal to you? Some of the stories that have made the very strongest impressions on me have been novellas. In particular, a couple of Zelazny's finest--Home is the Hangman, and For a Breath I Tarry--just knocked my socks off when I was an impressionable teen, and I've been stunned by the power of the form ever since. Silverberg's Sailing to Byzantium is another that to this day occupies my thoughts once in a while: these novellas are worlds, worlds more powerful than most novels. I enjoy short stories as well, but often they're just sketches, and leave you wanting more; novels, on the other hand, can sag in the middle unless the author is really good. The novella allows for depth of characterization and especially the worldbuilding our genre requires, but is short enough to remain taut and absorbing. There are many examples of novellas that have been expanded into novels, and the novel version is almost always inferior in power. You're also releasing another anthology, Eight Against Reality. Could you share with us more info about the book? Eight Against Reality is the Written in Blood writers' group anthology I mentioned earlier on. It's a combination of reprint and original work. The eight stories in the anthology span a truly fantastic range, from urban Fantasy to Horror, Alternate Reality to Shakespearean SF Satire. I think it's going to be a really, really strong volume. If this doesn't make a splash, the oceans have evaporated. Where did most of your contributors come from? Was it blind submissions or did you have to solicit from contacts? The Panverse series submissions are all blind, in response to the antho call I put out to Ralan's and Duotrope at the beginning of May. I'd gambled on a strong response because of the appalling dearth of novella venues. There are exceptions, like F&SF and especially PS publishing, but in general, unless you're a big name, it's impossible to get a novella published. My gamble paid off. Not only did I get a strong response--I'm still averaging four or five subs a week even now--but the overall quality has been generally quite high, with several subs from SFWA pros as well, which amazed me considering how little I can afford to pay. I think the length requirement coupled with the fact that I stated upfront that the work needed to be pro-level is why I'm seeing so few poor stories. This is great in that it's allowed me to keep a high bar on quality. Of course, its also made a lot more work for me, since only maybe 15%-20% of the stories are clearly bad from the first paragraphs. So I'm probably having to read further into many subs than the average slush reader, and it's often not until I'm several pages into a piece that it becomes obvious it has big problems. At the same time, I'm getting more of a gut feel for the kind of stories I'm looking for, so I zero in on them faster. Story. (laughs). A tale that takes me to a place and keeps me there, involving, delighting, and perhaps amusing me in the process. Something that doesn't piss me off. (laughs again). A story that resonates, that stays with you long after you've finished reading it. A story that lives beyond the page. What are the challenges you faced in both establishing a publishing company and editing anthologies? I won't pretend it's not a lot of work, but the process isn't really a very difficult one. The first challenge was researching POD companies and wading through all the lies and misinformation they put out about one another. Reading the fine print, I discovered that several POD outfits have an outrageous non-exclusive rights clause written in to their POD contract, which essentially means that they can publish your book themselves so long as they cut you in--so you're signing away a significant part of your rights. In the end, I settled on Lightning Source, who respect your exclusive rights, put out a very high-quality product at a reasonable cost, and are dependable and efficient to boot. The editing part was a learning curve, too. I've got years of critiquing behind me, which helped a lot, but the first thing you learn when you put a call for manuscripts is triage. In the first week I received over twenty subs, all novella length. Since I'd made it a point of honor to always respond inside 30 days on submissions--I have very strong opinions about the sloppy practices in the industry--I'd set myself up for some serious work. But I learned very quickly that everything editors say is true: you really can tell within a page or two, sometimes even a few lines, if the story's worth reading to the end. Have you considered pursuing other vehicles for publication, such as eBooks and podcasts? Yes. Panverse One is--finally--available for the Kindle, and believe me that formatting the book and dealing with Amazon's rather onerous requests for proof that you have rights to publish all your authors is royal pain. I'm looking at the ePub format right now, and how best to sell in the format. I'll be looking at audiobooks soon. I agreed nonexclusive rights for audiobooks with the Panverse authors, so that they're free to publish their stories as standalone audio versions right now. In fact, one of the novellas in the anthology--Delusion's Song, by Alan Smale--has been picked up by Bull Spec for standalone issue as an audiobook in several languages. And podcasts? Damn, but there are just too many technologies to track. Maybe! (laughs). Moving on to other things, how did you become acquainted with genre fiction? I guess my first exposure was The Iliad and the Arthurian Legends, closely followed by the Jules Verne classics; I'd probably read all of these by the age of nine or ten. Then Edgar Rice Burroughs, Asimov, and the R.E. Howard Conan novels. A pretty typical trajectory, I imagine. Asimov, A.E. Van Vogt, Anderson, Ballard… and, more than anyone, Roger Zelazny, are the ones that made me a slave to the genre. As an expat European living in CA, do you see yourself as an American, a European, or both? European, without a doubt. I do notice I've changed when I visit Europe. After all, I've been in the US for 20 years, with the exception of the year we spent living on a tiny Greek island in 2007. But culturally and in terms of core values, I remain a British-born Italian to the core. Even after 20 years here, I find it impossible to understand why Americans get so worked up over things that seem to me inconsequential, while at the same time putting up with things that would have Europeans rioting in the streets. What is it like, juggling the day job, the publishing company, and your own fiction? How's the last part getting along? Actually, the last part--my own writing--isn't doing too badly. In fact, the experience of reading so many subs and editing these anthos has really helped me to internalize, to understand at a visceral level, all the things that can cause a story to fail, or a reader to lose interest. I've just started work on a novel, and am amazed at how much my own writing has benefited from the experience. What did suffer, for a while, was my leisure reading, especially when I was buried in working with the authors of five manuscripts on editing their work, reading all the galleys, etc. But the juggling isn't bad. The trick to time management is to be organized, keep people informed and on track, and stick to a schedule. If you let things slide, then you're in trouble. What advice do you have for aspiring publishers? Hire me as a consultant! (laughs). No, seriously… I think the best way to approach it is the same way you go into a casino: decide just how much you can afford to lose before you go in the door. Beyond that, everything I said above: research the topic, and do everything to the absolute best of your ability. Which, when you think about it, is probably the way to approach any undertaking. God! Now there's a topic. How many pages do we have? (smiles). Probably the best advice is the advice Gardner Dozois gave my Clarion west class back in 2002. "Be audacious," he said. He went on to explain that a lot of the stories in the Asimov's slush pile were actually fairly competently written, but nothing about them really made them stand out. And he was right. There's something about professional-level work, something in the voice and tone and attack, that grabs you right from the get-go and doesn't slacken off. Of course, all the component parts have to be working, too, but the only secret is to grab the reader from the first line and not let them go. That doesn't mean pell-mell action is a must, either. There's a reason they're called stories. I once read in a book on writing--maybe Algis Budrys's little gem, Writing to the Point--that there are three reactions the writer should never, ever provoke in a reader, since each of these may result in the reader putting the book aside or tossing it across the room. These reactions are, Huh? So what?, and Oh yeah? The first means the reader hasn't understood something, and it's broken the spell; the second, that the reader doesn't care; and the third, that the reader doesn't believe you. That still seems like good advice. Finally, grab a copy of Stephen King's excellent little book, On Writing, and make it your bible. Find a good crit group if you can, and not only for the critique: writers need to be around other writers. Read a lot and write a lot. Make time for exercise and staying healthy. And above all, be tenacious. Writing isn't for cissies. Thanks, Mr. Tan, for running this interview. Great advice for aspiring writers, as well. Cool interview. Cool *and* realistic! My three favorite books about the writing life are Stephen King's On Writing, Annie Dillard's The Writing Life, and Ray Bradbury's Zen in the Art of Writing. Great interview: interesting and informative. Good luck to Dario, and congratulations on Panverse One, it's terrific. Dario is one of my favorite people, and I'm please to see him spotlighted in your Blog. Panverse... Hope it does well. Wow, great interview. I have to admit that my heart skipped a beat when he mentioned that Bull Spec was doing an audiobook for "Delusion's Song" -- my narrator just finished narration days ago, well ahead of schedule. Thanks for mentioning Bull Spec, Dario!